Lateefa bint Maktoum received her bachelor’s degree in visual arts from Zayed University in 2007. She is the founder and director of Tashkeel, a public studio complex that provides state-of-the-art facilities for artists and designers living and working in the United Arab Emirates. 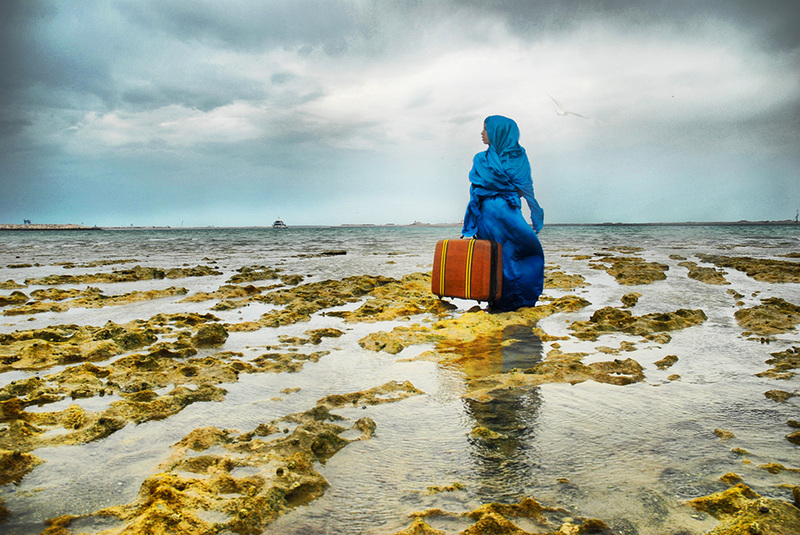 Since 2008, bint Maktoum has shown her digital photography and films internationally, including at exhibitions in Australia, China, Italy, and the United States, among others. She has received several accolades, such as the Ibda’a Media Student Award for digital photography and the Sheikh Mohammed bin Rashid Al Maktoum Patrons of the Arts Award. Her work can be found in private and public collections worldwide. Bint Maktoum currently lives and works in Dubai. Lateefa bint Maktoum combines many of her images to create digital photomontages depicting ethereal scenes that examine transformations in the UAE’s landscape and culture. Using her personal experiences from living in Dubai, bint Maktoum portrays faceless observers of change to convey Emiratis’ ability to embrace the future while maintaining their identity and remembering the past. The Last Look presents a female figure, standing on a shallow sea shelf and looking towards the horizon where a sandy outcropping emerges. The latter reveals the construction of Palm Jebel Ali, an artificial archipelago situated off the coast of Dubai. The woman’s suitcase symbolizes Emirati heritage and represents her perseverance to keep traditions alive despite the changes happening before her.